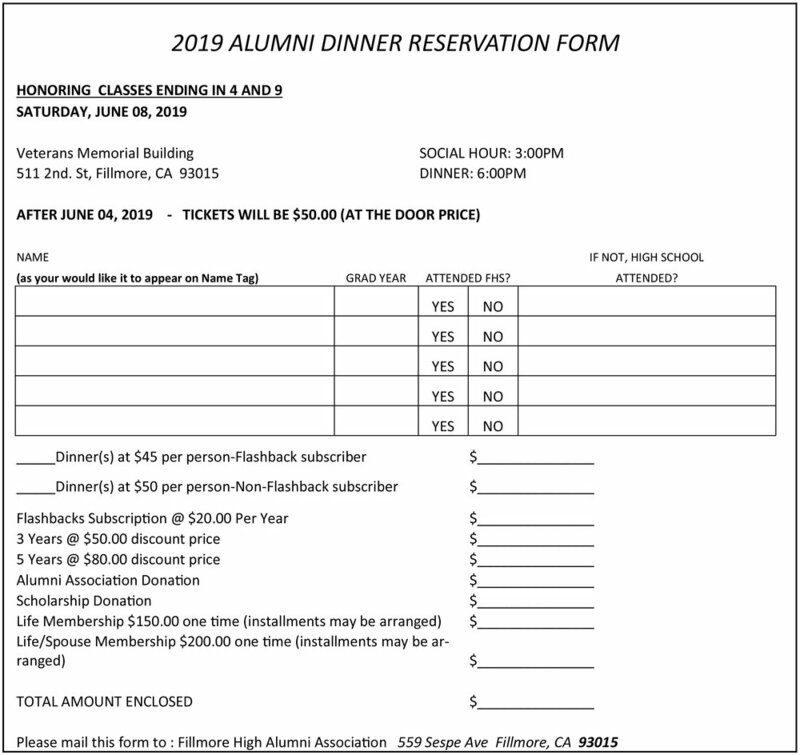 Please join us for the 106th Annual Fillmore High Alumni Dinner on Saturday June 8th, 2019. Last year we served well over 600 Alumni and their guests and we expect to do the same this year. Your paid dinner reservation guarantees your entry to the event, dinner (includes coffee, tea, and water) and access to the social lounge, bar, and dance. Many classes are having their reunions at the dinner. If you would like to have your reunion at the dinner, please contact the alumni office. FINAL DAY TO GUARANTEE YOUR RESERVATION IS JUNE 4th, 2019. AFTER JUNE 4th, 2019, IF NOT SOLD OUT, BOTH MEMBERS AND NON MEMBERS MAY PAY AT THE DOOR FOR $50.00. To avoid disappointment, purchase your reservations online now. June 8th will be here before you know it! You may purchase your reservations online now below starting with Step #1. Or, click on the reservation form below to print it out and purchase in person or by mail. Please submit your completed Reservation Form in person or by mail to the Alumni office. If you'd like to pay cash, please drop off your completed Reservation Form at Patterson's Hardware, 362 Central Ave, Fillmore. Thank you. Step #1 - Purchase Your Tickets Online Now. Please click the appropriate "Add to Cart" button below FOR EACH PERSON ATTENDING THE DINNER. For example, if you are making dinner reservations for 3 people, you will need to click on the appropriate "Add to Cart" button 3 times. Step #2 (optional) - Please consider helping the Alumni Association continue for another 100 years by making a donation to the Alumni Association Fund. Every penny counts. Since 1913, the Fillmore High Alumni Association has been bringing people together to support education, students and the community of Fillmore. Our mission is to provide scholarships to Fillmore High seniors and any graduate of Fillmore High seeking to continue their education. To make a donation, please click the "Add to Cart" button below. Step #3 (optional) - Please consider helping increase the amount we award annually to our scholarships recipients by making a donation to the Alumni Scholarship Fund. Your donation to the Alumni Scholarship Fund increases the annual amount the Alumni Association is able to award to each scholarship recipient. Give the gift that keeps on giving. To make a donation, please click the "Add to Cart" button below. Step #4 (optional) - Please consider becoming a paying Member of the Alumni Association. Benefits include discounts, access to our quarterly newsletter, and Members Only section of our website. Please consider becoming a Member or renewing your membership to the Alumni Association. For each membership, please choose the number of years and click on the "Add to Cart" button below. Step #5 (optional) - Please consider making a Donation or Donation In Memoriam to the Alumni Association. Donations and Donations In Memoriam help the Alumni Association to continue its more than 100 year mission to help Fillmore students reach their educational goals. Your Donation In Memoriam recognizes a friend or relative who you would like to make a donation in their name. Please click the "Add to Cart" button below for each person you would like to make a Donation in Memoriam. When you're finished, please click on the shopping cart to checkout. Thank you.